Be yourself. Especially do not feign attention. Thank you for visiting Valdes; happy to know the words spoke something to you. Part 2 still is, look forward and Happy November!!! It is great having you pass by; looking forward to “Rachealizing” with Rachealizations. Do have a blissful November!!! “With all its sham, drudgery and broken dreams, it is still a beautiful world.” and then, (not so much my fave ‘be careful. Strive to be happy”. 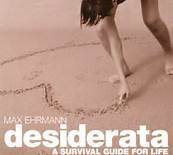 The last part (DESIDERATA 2) will be posted soon enough. Just thought to divided so we appreciate a little at a time. Thank you once more for visiting and commenting, and do have a great November!!! Ahhh! Sorry! I jumped the gun! Hi Kirt, thanks for passing by. It is a pleasure sharing the DESIDERATA. It always seems to be so relevant. All the best for November!!! Thanks for the reminder Sally! Great post! Thank you for the visit especially. I am glad the words spoke something positive to you. Look out for the second part. Sure it’ll be Worth the while. Thank you too for the like, the reblog and the follow. I am truly grateful. Some useful ideas, put so very well. Hello Greg, I appreciate greatly the like, the reblog and the follow. Most importantly the time out for the visit. I am glad the words spoke to you as they did me. Thos words are something else, especially the second part. Very Touching Poem. Thanks To De Author I Now Know That I’m Also Better Than Some Other Person, I’m Not The Least Nor The Highest In Life. his words are just so true, I couldn’t help but post them. All the best Imma, mwammmm!! !